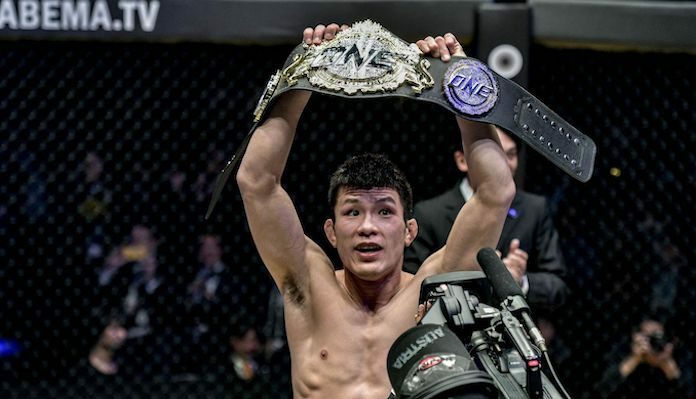 ONE: A New Era in Tokyo, Japan was so stacked that some fans worried ONE Championship might be overdoing it; that the promotion’s next few cards might suffer as a result. On Thursday, ONE Championship CEO Chatri Sityodtong announced multiple fights ONE: Enter the Dragon in Singapore on May 17, and it looks like it’s going to be a huge card. The card will be topped by a lightweight title fight between new champion Shinya Aoki and his Evolve MMA training partner Christian Lee. The 20-year-old Lee, who is the younger brother of ONE atomweight champ Angela Lee, has previously fought at featherweight, but will move up in weight for this mammoth challenge. Sityodtong also announced that this Singapore card will feature all eight quarterfinal bouts for the ONE Featherweight Kickboxing World Grand Prix, featuring names like Giorgio Petrosyan, Yodsanklai IWE Fairtex, “Smokin” Jo Nattawut, and Andy Souwer. Finally, this ONE Championship card will also feature one of two Lightweight World Grand Prix semifinal fights, as Saygid Guseyn Arslanaliev will battle Ariel Sexton, with the winner advancing to the finals. This card could also potentially feature the ONE Championship debut of former UFC champ Vitor Belfort as well, though this is far from confirmed just yet. Hearing that the plan is for Vitor Belfort to make his ONE Championship debut on May 17 in Singapore. Apparently negotiations are underway with Roy Jones Jr., but we’ll see how that goes. What do you think of the lineup for this upcoming ONE Championship card?